Part of where I want to take the blog this year, includes sharing more tutorials. Sometimes they will be for a finished project, sometimes they will be just a technique, sometimes just a little hint or tip I’ve picked up along the way. Last week, I shared a tutorial of the “finished project variety” over at And Sew We Craft – a new keychain I’ve been thinking of making for a long time. Amy commented how I made it sound so effortless, and that she was now inspired to give metal stamping a try, so I thought today I would share the corresponding technique tutorial to show you how to make your own stamped metal charms. A work surface – something to support your blank as you belt the living daylights out of it. This work board might look like it’s seem better days, but it is perfect for my uses. Solid enough to support the blank, but with a little bit of give in it, and I’m not worried about creating pock marks in it. 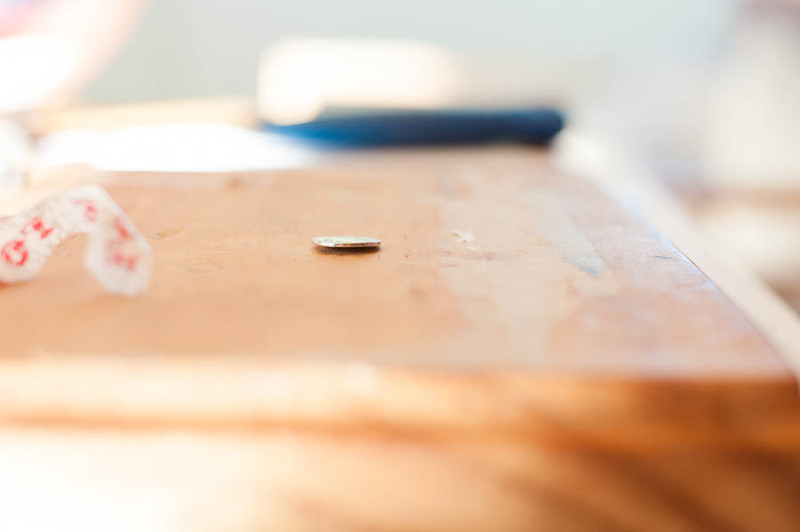 A metal blank – the one shown in the picture above is a Vintaj Natural Brass circle blank, the blank shown later in the tutorial is a soft strike pewter river stone blank (in bulk on Amazon* ). A sharpie, pencil/pen, and ruler. Solvent (not shown) – must tutorials suggest rubbing alcohol. I used tea tree oil because I am too lazy busy to go buy some, and also I’m a tightwad & tea tree oil I already had on hand. Start by taping your blank to your work surface. Stand back. Look at it a bit. Decide the tape doesn’t look quite straight. Remove tape, replace in exactly the same spot. Squint, tilt your head & decide “close enough”. (If you look closely under the pink tape, you can see the hole. Now look at the “love” tape – see how it looks on an angle?) NB – I started with just the lower tape – I added the second after three letters for some stability after the blank started curving upwards due to the stamping. With a ruler, find the approximate centre of the blank and make a mark, then add marks either side for the rest of your letters. I was using 3mm stamps so I made my marks every 3mm. Pick out your stamps, playing race the baby, in an attempt to check the stamps on the table before the baby grabs his next handful to chuck back in their container. Breathe a sigh of relief when you beat him at his own game & find all the letters you need. Where you start stamping is personal preference – I like to start in the middle in case I need to adjust spacing so my word will still be nice & centred. Place the stamp with the letter oriented up. If you are an unco-ordinated goose like me, lift it back up, double check it actually is facing the right way, and then set it back down on the face of the blank. Once you think you have it straight & correctly oriented, gently slide it down until you feel it run up against the edge of the tape. Depending on the tape you use, it may be a very subtle feeling (washi isn’t very thick, so it can take a few goes to get used to the feel of the stamp finding the edge). Do you best to make sure it is as upright as you can make it. Stamping time! Grab your hammer, and harness your best Mondayitis bad mood. When you are stamping, you want one good clean strong hit – straight down & up. Whack your first letter, and check out your handiwork. Not bad, not bad at all. My “G” was a bit wonky, and the imprint a bit soft on one side, so I obviously had it at an angle. 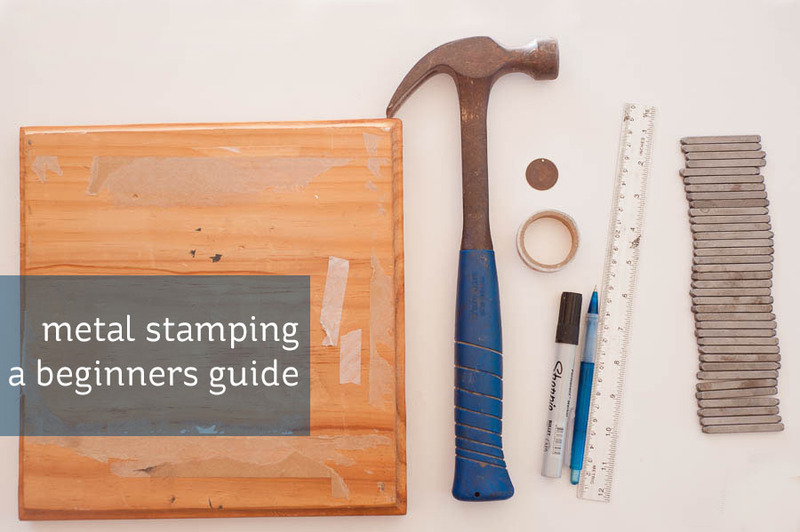 With one done, move out to each side, lining up your stamp with the tape and the marks on it for spacing. Keep an eye on the shape of your blank. Once it starts curving a lot, it can create movement. Grab a second piece of tape/any random piece sill stuck to your workboard, and tape down the top, and finish stamping. With the stamping complete, the blank will need flattening. Technically, one should use a rubber mallet for this. Technically, we own a rubber mallet. I think. But it was allllll the way up in the shed in the camper trailer, and, well, I had a hammer in my hand already, you know? Plus Beetle was busy climbing all over the table & was already squawking every time I pulled him off & turning my back on the monkey man didn’t seem to be the smart option. So I flipped my blank face side down on my work board, and gently tapped with my regular old building hammer to flatten it. Finally, to make the word really stand out, colour it in with the sharpie, making sure you get into all the crevices. Then with your rubbing alcohol/tea tree oil (I imagine eucalyptus oil would also work? ), gently rub at the top surface with a paper towel to remove the excess ink, and ta-da! One pretty little stamped charm. Yes it’s a bit wonky, and the letters aren’t quite straight, and the impressions aren’t consistent. I could get grumpy that I “wasted” one of my favourite blanks. Or I could remind myself that practice makes perfect and blanks are cheap and I can buy more, but I’ll never get better if I don’t begin to experiment & play. I’m not entirely sure what I will use this one for – I have a few ideas, so it will go into the stash for a bit while I percolate the ideas a bit more. Do you have any tips for beginners that I have forgotten to mention? Leave them in the comments below! * links marked with an asterix are affiliate links and I may receive a small commission on items that you purchase using these links. Adds 3mm pounding tools plus rubber hammer and blanks to my birthday wish list! I have been playing with leather, but my borrowed pack appear to be bigger letters & are coming out wonky! Are you using a guide of some type? I’m yet to try mine on leather!